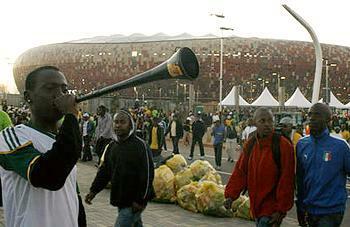 JOHANNESBURG, South Africa, June 11, 2010 (ENS) – A major initiative to green the FIFA 2010 World Cup and reduce carbon emissions is underway in the host country South Africa as the opening match between South Africa and Mexico kicks off here today. The initiative is a result of a partnership between the Global Environment Facility, the United Nations Environment Programme, UNEP, and the South African Department of Environmental Affairs, DEA. DEA and UNEP have secured US$1 million in funding from the Global Environmental Facility Fund to conduct the following projects in six of the nine host cities. Reduction of energy consumption by retrofitting solar panel on public street lights, traffic lights and billboards in the six host cities. Twelve billboards, two in each city, will switch to solar power, along with 60 traffic lights and 78 streetlights across the six cities. Promoting low carbon participation, through the activation of the Green Passport program which promotes green standards in tourism and accreditation, and an awareness program. The Passport, a 32-page booklet packed with greening tips and information on responsible tourism in each host city, will be distributed to 100,000 World Cup spectators. Commissioning an independent assessment of the program through the measuring of carbon emissions reduction results from the project, which will use this sport event to change practices and behavior. Together, the DEA, the Department of Energy, Department of Tourism, the Central Energy Fund, the power utility Eskom and the Local Organizing Committee, have identified five carbon offset projects that will help to offset travelers’ emissions. The projects include solar cookers, soil composting, LED energy efficient lighting retrofit, wind energy and domestic fire lighting. The identified offset projects will be attached to a carbon calculator, which will enable travelers to calculate and offset their emissions against an offset project of their choice. The six participating host cities are: City of Tshwane (Pretoria), Johannesburg Metropolitan Municipality, Nelson Mandela Metropolitan Municipality (Port Elizabeth), Polokwane Local Municipality, Rustenburg Local Municipality and Manguang Local Municipality (Bloemfontein). Of the 32 countries that have qualified for the World Cup tournament, six are from Africa South Africa, Ghana, Ivory Coast, Nigeria, Cameroon and Algeria. The tournament is taking place in eight of South Africa’s nine provinces, using 10 stadiums in nine host cities. 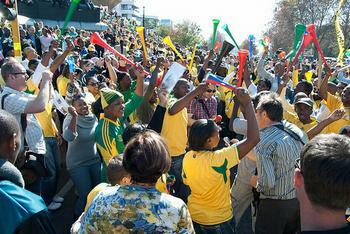 Johannesburg is the only city with two venues for the competition – Soccer City and Ellis Park. “In this regard, we have initiated several programs as part of this green legacy which should benefit South Africans from all walks of life, now, and continue beyond the moment when visitors leave our shores,” said Sonjica. Eleven teams have announced they will offset the emissions caused by their participation in the event. Seven of these teams enjoy the sponsorship of PUMA for their offsets: Algeria, Cameroon, Cote d’Ivoire, Ghana, Uruguay, Italy and Switzerland. In addition, Chile, England, Republic of Korea and Serbia have committed to offsetting their own emissions. The teams’ carbon footprint that will offset includes international flights to and from South Africa, domestic flights and coaches to and from group matches for teams and officials, and accommodation in hotels – a total of approximately 6,050 tonnes of greenhouse gas emissions. Part of the South African government’s National Greening Framework, officials involved in the greening effort intend to encourage municipalities to continue after the tournament to save energy consumption by adopting renewable energy and energy efficiency practices as illustrated by solar retro-fits. Following the World Cup, UNEP will conduct a comprehensive Environmental Assessment to review how key environmental issues have been addressed by the tournament organizers and compile experiences and lessons learned. The host cities’ green efforts also will be assessed in order to ascertain how greening solutions were delivered and to what extent they were successfully implemented. An SMS messaging campaign has been initiated in partnership with Business, viz., Foneworx and KPMG to generate funds towards offsetting of the 2010 Carbon footprint. This campaign is only active in South Africa. To show support for the 2010 Carbon offset program, SMS “GOGREEN” to 34066. SMS charged at R2.00. Free SMS do not apply. Eskom, a partner to the greening initiative, confirmed it will donate the green portion of its existing green energy generated from today through July 11 in an effort to reduce the 2010 carbon footprint. Eskom confirmed member utilities of the Southern African Power Pool also will take part in this initiative.